Clover honey is a monofloral variety of honey made from the flower nectar and pollen of clover flowers. It is a light-colored honey with a pleasant and mildly sweet taste and a fast crystallization time. The variety is a source of vitamins and dietary minerals as well as other element of nutritional value. Its therapeutic action includes benefits for the digestive and respiratory systems in particular, helping soothe an upset stomach and a sore throat, calm cough and improve transit time. Clover honey is also great for acne and other skin issues and fatigue. There are several species of clover whose nectar serves as food for honey bees and as raw material for honey production. White clover (Trifolium repens), also called Dutch clover, red clover (Trifolium pratense), the alsike clover (Trifolium hybridum) are three widely cultivated and naturally occurring species from which clover honey is commonly produced. The first variety bears white flowers, the second dark red or light red purple, while the third is white and light pink at the base of the flower. Overall, there are several hundred different species and the nectar of any of them can be sourced by honey bees and made into honey. What is clover honey? Real clover honey is a monofloral honey, meaning it is made predominantly from clover flower nectar and pollen. While it may contain other flower nectars, clover nectar should have the best representation of all nectars present. But considering the extremely wide distribution and extensive cultivation of the species, clover honey is also present in a variety of other monofloral honeys in smaller amounts. However, as long as it isn’t predominant, it cannot be labeled ‘clover honey’. So check the label and origin of your honey for important information like composition, pollen count and always choose raw, organic honey from trusted sources with a reputation for clean and responsible honey production. What does clover honey look like? The variety is generally light amber in color. Nevertheless, depending on the species of clover providing the nectar and the distinctive characteristics of other flower nectars present in the honey, color may vary slightly from a very light, almost whitish, clear yellow to a more pronounced amber color, but nevertheless light-colored. Crystallized clover honey takes on a paler pigment and becomes opaque. What does clover honey taste and smell like? Overall, it’s a good-tasting honey with a delicate flavor profile and a lingering sweetness. A typical honey taste, if it can be said so, light and mild. Clover honey has a decidedly sweet and flowery aroma and a persistent sweet aftertaste. Secondary flavor notes include grassy notes. The honey has a fine floral and grassy or hay-like smell. Crystallization time. Just like acacia honey, clover too has a fast crystallization time. For this reason, many producers prefer to cream their clover honey. But while they claim it doesn’t alter its therapeutic action, if you want real clover honey with all of its properties and health benefits, then get it even though it starts crystallizing. It forms small crystals anyway, but at least you get an unaltered product. 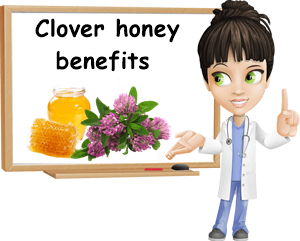 What are the health benefits of clover honey? Real clover honey, natural and unprocessed, meaning unheated, unfiltered and pure, is a healthy food with a varied therapeutic action. It is reportedly used for its benefits on the respiratory, digestive and immune system, but also for its excellent effects on skin health and tonic, energizing properties. 1) Antibacterial properties. Honey has been traditionally used as a wound dressing to hurry wound healing and prevent infection. But it’s only recently that studies have indentified the multifaced antibacterial action behind such benefits. For example, clover honey contains a strong natural antibacterial called hydrogen peroxide that helps reduce bacteria numbers. Moreover, it has a low moisture content and acidic pH that inhibit bacteria growth and do not allow the infection to spread. Lastly, its viscous texture can also be attributed antibacterial properties: when applied on a wound, honey does not let foreign elements in, all thanks to its special consistency (Honey: its medicinal property and antibacterial activity). 2) Encourages faster wound healing. Clover honey has natural antiseptic properties and has been shown to inhibit bacteria growth and even reduce bacteria numbers, in the right concentrations. Under certain conditions, it can be used to help wounds and burns heal faster in the form of a natural wound dressing. Still, it’s not enough to just put honey on a wound becase its effects are dependant on the concentrations of certain antibacterial elements like hydrogen peroxide and other components that are difficult to quantify. 3) Helps calm cough and soothe a sore throat. Honey is a time old remedy for respiratory infections from the common cold and flu to bronchitis, tonsillitis or sinusitis. While it does not clear an infection directly, it does help with symptoms and may accelerate recovery. The honey forms a protective barrier over the irritated throat lining that prevents further inflammation and helps soothe soreness and calm cough. 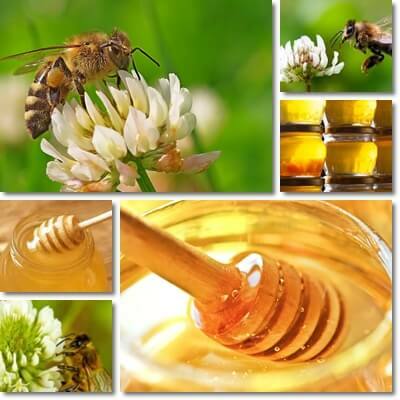 It has been reported that clover honey has mild expectorant properties as well. But it needs to be eaten raw and unheated and eating or drinking postponed for about an hour. If you add it to tea, remember to let the tea cool down to room temperature because heat destroys the beneficial properties of honey. 4) Stimulates the immune system. All honeys have a more or less positive effect on immunity. Clover too has been found to improve the immune system response via several mechanisms. For example, it contains pollen, a natural element with nutritional value as well as antibiotic and immuno-modulating effects (Bee Pollen: Chemical Composition and Therapeutic Application). For example, pollen particles have been found to increase vitamin C concentrations in the organs of the immune system that produce white blood cells (like the thymus), strengthen the body overall and activate the immune system to respond better to infection and disease (like in the case of wound healing). Moreover, both the antibacterial elements and characteristics of clover honey (hydrogen peroxide, pollen, antioxidant flavonoids, phenolic acids and high content of natural sugars, acidic pH and low moisture content) show impressive antibiotic properties. Studies reveal that, in the right concentrations, clover honey can inhibit the growth of antibiotic-resistant strain of bacteria like Staphylococcus aureus, Escherichia coli, Pseudomonas aeruginosa etc. However, keep in mind that only a doctor can evaluate medical situations correctly and decide if we need antibiotics or not. So see a doctor and discuss your options before you make up your mind regarding the best treatment for you. 5) Source of vitamins, minerals and other nutrients. Clover honey contains small amounts of several essential vitamins and minerals, notably B vitamins and vitamin C, but also potassium, phosphorus, magnesium, calcium, iron etc. Other relevant nutrition facts include the presence of small amounts of amino acids, elements that make up protein, but also pollen particles and enzymes with nutritional value. Below is a beautiful video of a bee sourcing clover nectar. 6) Helps combat fatigue. Clover honey is a good food for when you have low energy levels. Being rich in natural sugars like glucose or fructose, it helps combat tiredness and fatigue by raising blood sugar levels. Its good nutritional value also gives it tonic properties. 7) Good for hypoglycemia. The variety can be consumed to prevent hypoglycemia thanks to its content of natural sugars that ensure a quick boost in energy levels. One or two tablespoons provide energy for 15 or 20 minutes. However, diabetics should consult a doctor first before eating clover or any other honey. 8) Boasts prebiotic benefits. The natural sugars in clover honey give it mild prebiotic properties, meaning it helps feed the good bacteria in our intestines, contributing to better digestive health. Eating the honey can improve transit time slightly and offer some relief for constipation. Some people may experience runny stools or mild diarrhea if they eat too much honey. 9) Good for gastritis and possibly acid reflux. Its most impressive therapeutic action is on the stomach. As a result of its consistency and composition, clover honey soothes the stomach lining, helping relieve stomach discomfort in gastritis sufferers. But because matters of the stomach are never easy, it is important to remember the importance of an overall good diet for gastritis. Also, just like it helps soothe a sore throat, clover honey can prove soothing on the esophagus, potentially limitting damage from acid reflux. Thanks to its naturally viscous consistency, the honey forms a sort of protective coating over irritated, inflamed mucous membranes, preventing further damage and allowing them to heal. 10) Skin benefits. As someone with skin tone problems, I have found light-colored honeys like clover or acacia good for uneven skin tone. Raw honeys can be used daily as natural skin masks to help even out skin tone and combat dullness and dry skin. I have noticed they hydrate and nourish the skin, give it a soft, natural glow, not to mention exert a gentle cleansing action, being good for clogged pores and to reduce excess sebum on the skin, which can help prevent acne. In special preparations that augment its antibacterial properties, clover honey can prove efficient in treating wounds, burns, skin ulcers etc. Conclusion. Overall, clover is a great monofloral honey with a pleasant flavor profile and delicate taste. It can be good for a variety of ailments, from wounds, acne and dry and dull skin to gastritis, stomach upset, trasit problems, colds, flu or other respiratory infections and their symptoms. But in order to enjoy all the benefits it has to offer, it needs to be real honey, preferably organic, raw and unprocessed in any way, from trusted, reputable sources. Clover honey can be a wonderful addition to any diet, as long as you are not allergic to it. If you are allergic to either clover pollen or honey bees, then it’s best to stay away from this particular variety and, in the second case, all honeys and bee products in order to avoid an allergic reaction.